Welcome you all to our post on converting AVCHD video files to other video formats and here, we are going to discuss about the various format conversions of iOrgSoft Converter for Mac and Windows, such as mts to mov, mts to mp4, mts to wmv, and many more. Note: AVCHD stands for Advanced Video Coding High Definition. 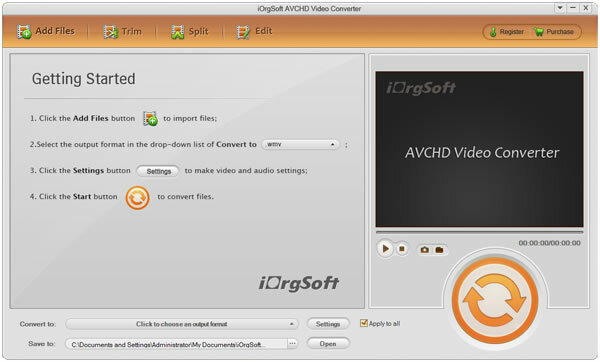 iOrgSoft.com has developed an AVCHD Converter for Mac and Windows, which allows you to convert your AVCHD files that include mts, mt2s, mxf, and xavc files to other commonly video formats, which include mp4, mpeg, imovie, dv, and mov. Supports almost all common video formats: This AVCHD Converter for Mac lets you convert your AVCHD files to almost all popular video formats, for example mp4, mpeg, wmv, dv, and flv. Supports portable mobile devices: With this converter, you can convert videos to the formats that are supported by portable media gadgets, such as iPhone 5, Amazon Kindle Fire, iPad Mini, and many more. Converts other camcorder videos: The converter allows you to convert other camcorder videos as well, for instance xavc, mxf, mod, and tod. Offers top quality: The videos that you get after converting with iOrgSoft Converter are of great quality and do not suffer from any sort of quality loss issues. In addition, the software has an add-on feature of “Smart fit”, which enables you to maintain the original resolution of the videos that are being converted from one format to another. Provides ultra-high speed: Using this latest video converter, you can enjoy all your high definition videos after converting them from one format to another at an ultra-high speed. Edits your AVCHD files: You can utilize the built-in video editing tool that comes with the iOrgSoft video converter and the video editing tool permits you to edit your high definition videos, such as cropping, splitting, trimming, and joining videos. Shares your camera recording online: This AVCHD video converting software consists of optimal presets for various social networking websites, which includes Facebook, Vimeo,YouTube and numerousothers. The great features plus the video quality and processing speed make this AVCHD files video converter a worth using software. You will not get disappointed by both the quality and the operability of the software.